Given all of 2016’s well-documented lowlights, no one is especially keen to give the year a rerun. 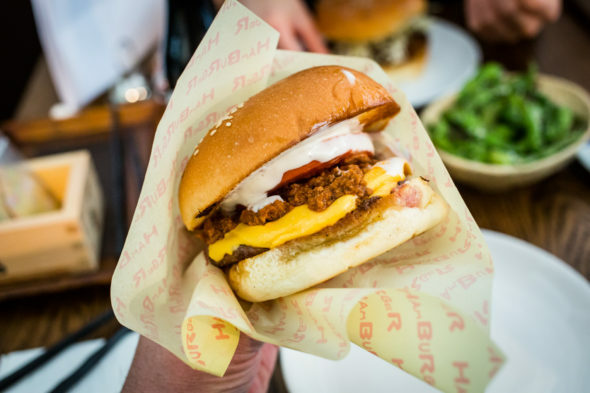 But it is worth recapping about the notable restaurants, bars and cafes that launched over the last 12 months in Sydney. There was a blockbuster-sized explosion of venues opening in 2016. 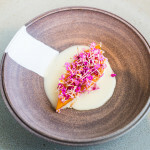 There were spin-offs aplenty (Bentley hoisted up a literal boat in its restaurant and focused on seafood for Cirrus; Bar H cracked out its vermouth collection and spawned Banksii; Three Blue Ducks headed to Rosebery for its third outlet with a half-tonne barbecue called Bob in tow; Rockpool morphed into Eleven Bridge and Porteno attempted high-achievement status by rebooting itself on Holt Street and launching Bodega 1903 at the Tramsheds complex). 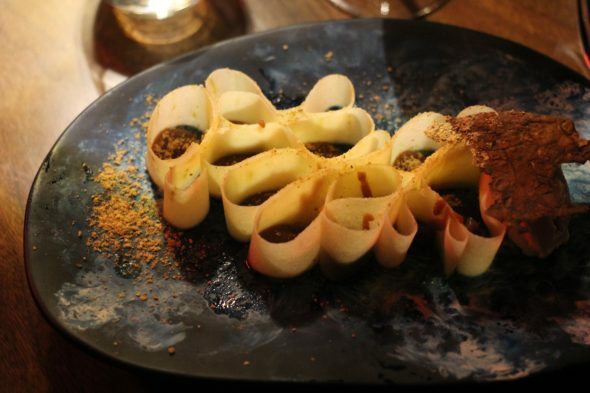 There were first-time outposts of big-name restaurants (like David Thompson’s long-awaited return to Sydney with the spice-powered Long Chim and Guillaume Brahimi turning a corporate office basement into a Parisian hideout with Bistro Guillaume). And then there was the blow-up of real-estate developments that used dining out as a tentpole attraction. This spring, multi-venue launches at Tramsheds, Barangaroo and Gateway at Circular Quay appeared to happen almost simultaneously. Actual non-development restaurants also opened at the same time and I wonder if they got lost in the pack. 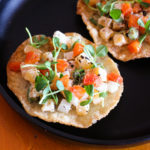 (I have a suspicion that more venues debuted in September than any other month this year and you could see it with the unpredictable coverage: it was hard to guess who would actually get the spotlight, unlike the orderly manner in which you can usually foresee which “it restaurant” will be in print next week.) There are plenty of establishments I still haven’t been to (that I would like to check out) and I feel like it might take me a whole other year to play catch-up! So, this is where I did end up going – and these are the places that made my list of 2016 highlights. The place I frequented the most was Clementine’s in Pyrmont; one of a few good options near work, it’s a tiny cafe that belongs in the “I’m glad you exist” files. 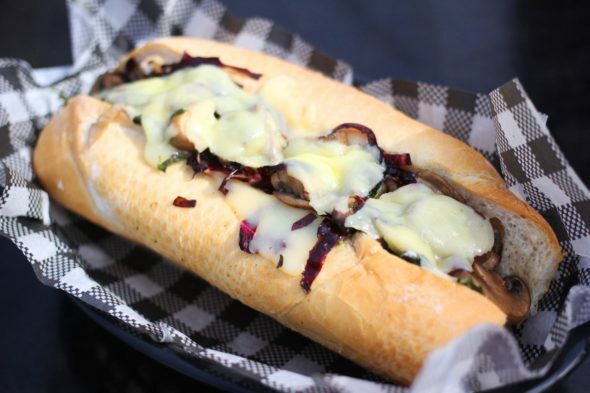 I ordered and re-ordered the Belluci sub all year, as it went from a mushroom-provolone-thyme bomb of a sandwich to its eggplant-parmy remix by 2016’s end. Friends also endorsed the Pesca grilled-peach and mortadella salad (which is named after owner Eric Mendoza’s girlfriend, who is actually a real peach). I also was a repeat-offender visitor at Rising Sun Workshop, which finally got its permanent location at one of the oldest hardware stores in Sydney. I had the Hokkaido Milk Bun with Mushroom, Egg, Cheese and Kim Chi, plus the Prison Bento for breakfast. The Eggplant Katsu Burger was my hi-rotation order for many nights throughout the year, while Will kept asking for the Grilled Skirt Steak that you could “gift-wrap” with lettuce and pickles like san choy bau. 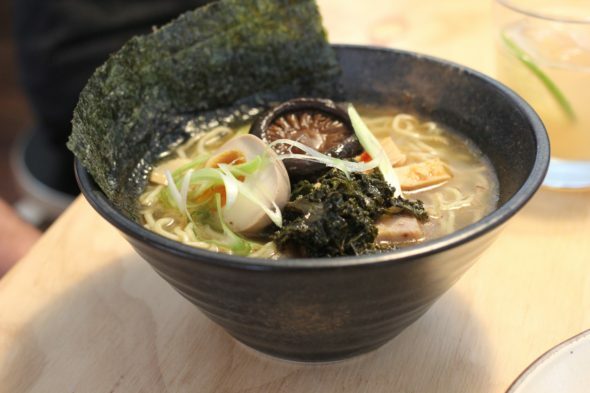 And of course, the signature ramen (The Light, The Dark, The Monk) that had initially won us over during Rising Sun Workshop’s pop-up phase made a highly welcome return. 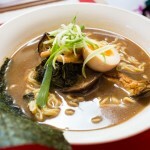 (They were joined by additional ramen siblings, like the Breakfast Ramen and Secret Ramen.) PS This was where I recorded my podcast with one of Sydney’s OG food bloggers, Helen Yee. You can catch her excellent round-up of 2016 over at Grab Your Fork, BTW. You could also measure my 2016 in return orders of the Crisp Potato ($12) dessert at Bar Brosé. Analiese Gregory’s category-destroying dessert contains both fast food and fine dining in its DNA (inspiration comes from both Maccas and legendary French restaurant Bras) and, as I wrote, it “looks like someone bulldozed a pop tart into brittle-thin shards – and sandwiched brown butter mousse and salted caramel in between like some miracle mortar.” Analiese is one of the country’s most talented young chefs and it’s no surprise that in Bar Brosé’s short life, it picked up a hat, a Good Food Award for Best Bar Food and also a placing in Terry Durack and Jill Dupleix’s list of 17 Australian Dishes You Must Try Before You Die. Also in the vicinity is Wilmer, the latest pop-up by Full Circle crew (who have a thing for short-term flings, as their temporary stints as Alfio’s and The Eat-In proved). Launched at summer’s start, it’s a two-man show, with Daniel Johnston and Harry Levy reuniting in the (very cosy) kitchen after their recent spells at Restaurant Hubert and Bar Brosé. The menu changes weekly and the theme is rustic Italian hits. Favourites include the Ceci E Tria, which is a triple-distilled delivery of chickpeas that sounds kinda wholefoods-y and potentially boring in theory, but is flat-out delicious in reality; plus the Ricotta Panna Cotta (a throwback to Daniel’s days at Vini) given a crime-scene-like spill of berry and the gritty crunch of crumble and rosemary. It’s going to be hard to say goodbye when Wilmer winds up; so far its expiration date coincides with the official end of summer days in 2017. At Bar Ume, they’re so serious about what they’re doing that they have stacks of Japanese burger magazines in their kitchen. Of course, it’s no surprise that they’re applying high-grade cred (and nerd-level depths) to the whole enterprise because Bar Ume is run by Kerby Craig, who famously got a chef’s hat tattooed to his neck after scoring the honour in the Good Food Guide. Bar Ume is phase two of the Sunday burger pop-ups that Craig would periodically stage at Ume restaurant; people were so adrenalised by the idea of ordering his Japanese-inspired burgers that the threat of intense storms and severe weather warnings did not deter them from joining the large queues. In fact, the events were a sell-out success and that day of insane flooding across the east coast actually led to his most record-breaking turnout of diners. In August, he flipped his one-hat restaurant Ume into the burger-focused Bar Ume; but (like in Japan), the side dishes are as awesome as the kakiage, prawn katsu, bacon cheese and classic signature bun-and-patty staples. Jerusalem Artichokes with Nori Mayo – there should be a support group for people who developed a strong addiction to these crisp and ultra-savoury numbers. Craig is still keeping classified what exactly makes his Umami Fries amazing, but you can just keep trying to uncover the secret every time you order them. They are so damn good. My friend Adele said it’s her favourite burger joint to open since Mary’s and I second her endorsement. 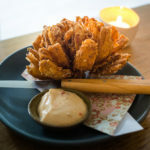 A second outlet – Ume Burger – opened in Barangaroo late in 2016. 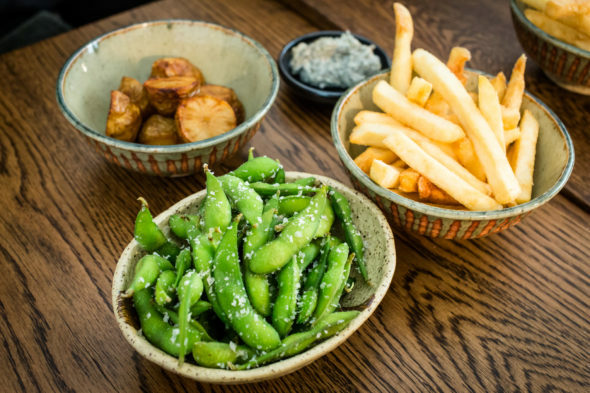 Gojima also deals in Japanese-style burgers – but there’s very little Venn diagram overlap between Bar Ume and Chase Kojima’s latest venture (the common ground: Umami Fries). 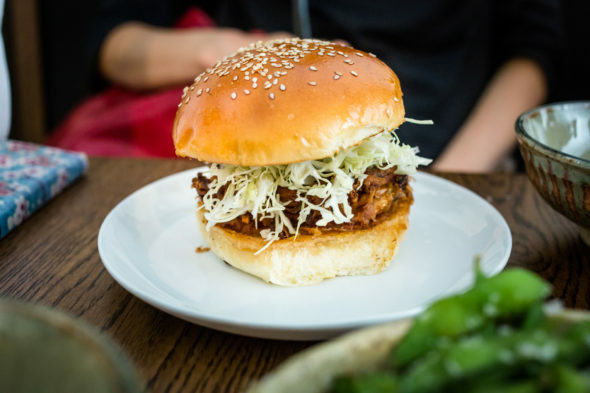 The Sokyo chef spent a long time researching the right grains and key ingredients for Gojima, which is Sydney’s first dedicated rice burger bar. The concept might sound questionable (and my friend Jenny raised her doubts before we sat down for our order) but the delivery is skeptic-busting levels of great. The rice is ultra-toasty and sturdy, so it tastes more like yaki onigiri merging with a delicious burger – rather than a bizarro sushi burger situation. I’ve witnessed thumbs-up verdicts for the cheeseburger flavour and the mushroom katsu burger is fantastic. The pickles, cheese, tomato, lettuce and special sauce situ is well mastered. It’s an oozy, messy and napkin-ruining affair, but worth it. I’ve gone on and on about Sydney’s good fortune to have Good Luck Pinbone around for the next stretch of months. Head in and order the fantastic eggplant, the potato and sprouts and the rave-review-inducing steak with furikake butter. Queen Chow and Fred’s were the anticipation-ramped Merivale openings that you spent the whole calendar year waiting for. Originally due in April-ish, Fred’s was first to launch, with Danielle Alvarez at the helm. Two years after Merivale had signed her on, the talented chef from Chez Panisse had her own restaurant to run in late October. Fred’s located in the most charming of sites, one that seems to be made of dream parts of French farmhouse kitchens and has a rustic menu to match. The char and burn of the the wood-fired oven and coals rules every savoury dish. I especially loved the Macadamia Meringue with Yoghurt, Chamomile and Strawberry Sorbet on the dessert menu. Queen Chow got its sweet doors open this month and I want to write a proper post about this soon. 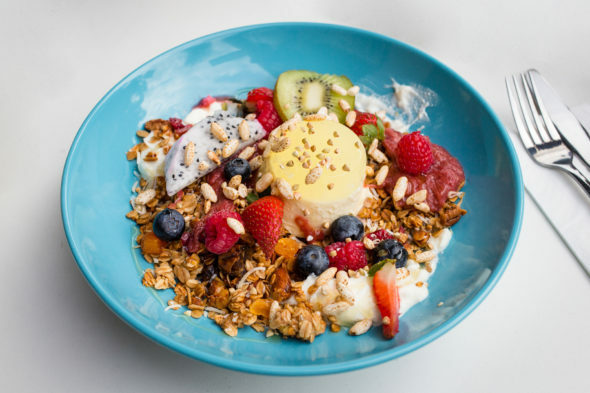 The short version: Patrick Friesen, Christopher Hogarth and Eric Koh’s slice of Hong Kong on Enmore Road was worth the incredibly long wait. 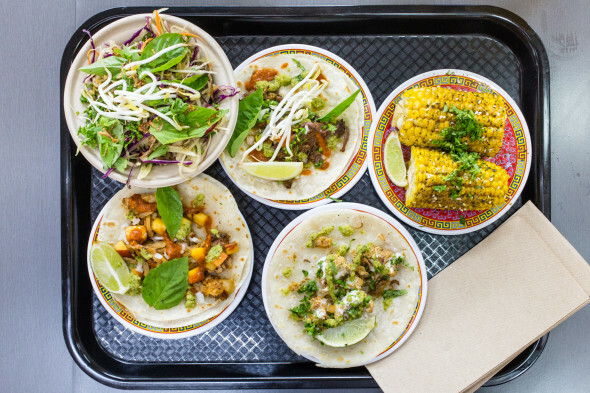 Chat Thai opened its largest ever outpost at Circular Quay – offering something that achieved the impossible in that touristy part of the city (where overpriced average food has an unfortunate way of reigning). The menu was budget-friendly (!) and also really, really good. The Garlic Chive Dumplings are all kinds of great and the Thai take on banh-xeo-style crepes are also a winner. Plus, you can try out food that has already been approved by the Noma crew. What’s there not to like? 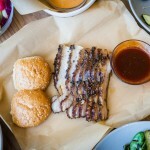 One of the most underrated places to open this year has to be Hem Nine Nine. Its thin Tetris block floorplan is meant to remember an alley and this venture by the Mama Linh’s crew offers a modern take on street-level Vietnamese food. 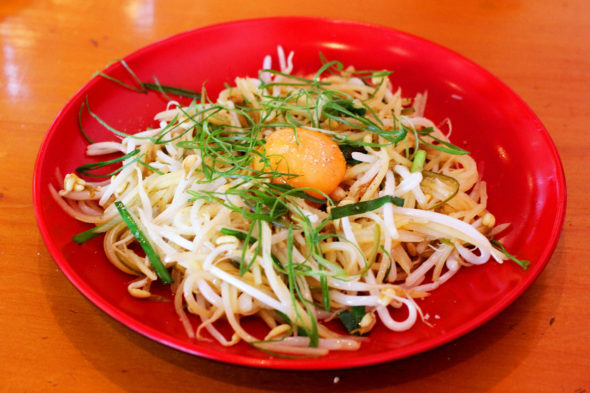 The tasting paddle of pho is inspired by a similar move that craft breweries pull. This have-it-all move means diners get to try mini serves of the 18-hour wagyu beef broth, free-range chicken version and the mushroom-loaded vegan pho. The Dolphin got rebranded and reworked by the Bondi Icebergs Dining Room and Bar crew – its Keith-Haring-like makeover by George Livissianis wasn’t the only thing that scored rightful attention. There’s also the excellent pizza (with every aspect kept Australian and local as possible, except for the anchovies and the Italian fellas making it) and beverage director James Hird‘s next-level wine wall (with next-level bottles to match). And of course, Restaurant Hubert won pretty much every Best New Restaurant award it was up for. From the stylish descent down into the French-inspired venue, the insanely popular venue by the Shady Pines crew has cast a long spell on every guest that’s walked in. The menu by Daniel Pepperell was always going to have guaranteed fans and the fact you can now book in for lunch only makes it extra appealing. Meet Gerard was one of my favourite cafes to open this year and I was happy to see Two Chaps breed a spin-off: El Chapel (also vego, also charming and great). Also entirely meat-free: Cornersmith‘s charming new Annandale outpost. Mike McEnearney set up No 1. Bent Street in the city, with his wonderfully unfussy and to-the-point food on offer again after Kitchen By Mike’s closure (which since has had its Koskela space taken over by Three Blue Ducks). Do order the Rice Pudding if you can – it’s seemingly simple, but so damn good at the same time. PS40 was the city’s first dedicated soda bar and soda factory and Shortstop Coffee and Donuts finally made its Sydney debut, giving you another reason to loop around to Barangaroo to stock up on its Earl Grey and Rose and New Orleans Iced Coffee flavours. Serial multitasker Morgan McGlone somehow managed to open two more Belles Hot Chicken outlets (and launch a Hong Kong restaurant!) as well as take over the menu at Harpoon Harry (where you can get Johnny cakes with pimento cheese that taste like an amazing version of Le Snak). I was happy to see the ultra-talented Yu-Chung Lee (Lemonpi) become permanently in charge of the pastry window at Boon Cafe. Her Yuzu Chiffon cakes, Matcha Cookies and Strawberry Hojicha Tarts rule – and are unlike anything else you can ask for in Sydney right now. I loved that Yellow now has an all-vegetarian dinner menu and has been slammed with enthusiastic diners since it made the change in February. But it was also flat-out sad to say goodbye to long-time favourites Ghostboy Cantina and Moon Park – and all the other high-profile closures this year. Also, Angie Hong’s pop-up at White Taro was fantastic while it was around. Also, how could I forget the most life-changing meal I had this year? 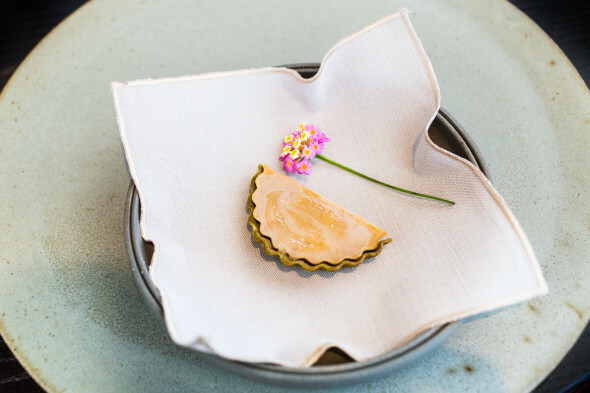 It was at Noma Australia – the restaurant that made me zoom out and look at the country I live in such a new way. The shock and awe from its 10-week residency in Sydney will continue for years, I think. 2016 was a year of crazy, but kudos to all the venue owners, baristas and chefs that guaranteed us moments of greatness. Thanks also for dropping by, even though this blog has been a bit dormant during this crazy-busy year I’ve had. Bring on 2017 – I hope it ends up being memorable in all the right ways for you. Thanks Helen for your always AWESOME support! You are the greatest. It was really excellent to finally interview you for the podcast this year. I loved your 2016 recap, too. Thanks again and happy new year. Hope yours is fantastic and filled end-to-end with the best food and company! Kerbs burgers and Nick’s ramen were some of my 2016 highlights too! Awesome round up Lee. Thanks so much for the nice words, Raff! So glad you dug those dishes, too. Hope your 2017 ends up full of great menu highlights, too! Bookmarked this page for every nice dinner I need to plan. Thank you for the killer resource! Thank you for your 2016 compilation. We have just come back from a delightful meal at Yellow. delicious and innovative. Thanks so much Rene for your kind words – and I’m happy to hear you had a good time at Yellow! It is a fantastic restaurant and it really pushes the boundaries on what vegetarian dining can be.